In 2010, I decided to write a book. At that point, I had taught Swedish for two or three years, and also came back to Stockholm after seven years abroad, and I had truly discovered what weird habits Swedish people comply to. I decided to compile one-habit-a-day sort of book, where each day in the calendar would prompt the reader to embrace some Swedish way of doing things. Well, life (and mortality, unfortunately), came in the way, and my book never happened. Opportunity has come back, but now I have a different focus (stay posted, folks) and this project is no longer qualifying to my top-ten books to produce. But do not despair, because in the meantime, and without my knowledge, involvement or consent, my book has already been written! 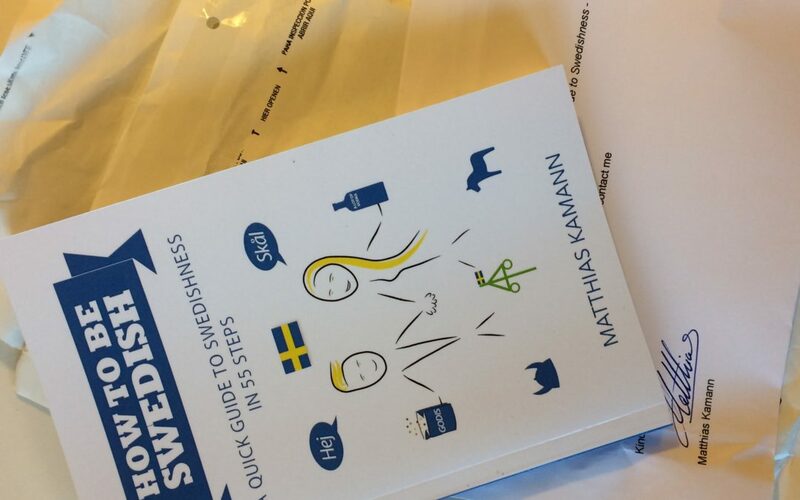 In 2017, Matthias Kamann, a swedified German residing in the mighty town of Växjö, published How to be Swedish - a quick guide to Swedishness in 55 steps. As you can derive from the title, his readers are missing out of 310 of my quirky Swedish habits, but that is probably for the good. As the title implies, this is a how-to book and nothing else. There is no trace of analysis, no asking of Why and What for? There is little historical reference, and a refreshing lack of values in compliance or in conflict with Swedish ways of reasoning. And here, I believe there is plenty to learn from Kamann. Although he finds the idea of taking off his shoes when entering someone’s home slightly eccentric, there is no attempt to rebel. He even finds his own system, carrying around a pair of slippers, although he becomes the subject of laughter at a student party. He observes his Swedish neighbours paying careful attention not to talk to each other, but he does not judge (well, at least he does not waste his time on judging). He acknowledges pre-school children dressed up in their reflexvästar in winter, and correctly concludes that such measures are necessary on a latitude where winter nights set in right before your early afternoon fika. With this in mind, this is not so much a guide book to Sweden as a piece of travel writing, or perhaps settling writing, depicting Kamann’s own experience of becoming a permanent resident in Sweden. I do not have the pleasure to know him personally, nor the nosiness to look him up on Ratsit.se, but I would guess he would qualify as still looking forward to (or dreading) his thirties. There are some substantial sections related to partying, meeting a new partner (or several), flirting, and such activities that I (soon 36) categorise as belonging to the past. In this way, How to be Swedish is not at all all-encompassing, but fairly narrow in scope. Not only in terms of stage of life, but also geographical location. For example, in the very relevant section of godis, he brings up the on-going debate on how to pronounce kex, with a soft (sh) or hard (k) k. Well, here in Stockholm, there is no such debate because there is only one way to do it (with a hard k), despite the whole west coast of Sweden having it wrong. Kamann, who was lucky enough to find his new home in Småland, by chance ended up in the very trenches right in the middle of the kex pronunciation war. This is a good thing. Because there is not one, but many ways, to be Swedish, and Kamann is showing us this. And for reference, what did he fail to include, that you would have had the pleasure to read in my version of the same book, in a parallel universe? Well, you are missing out on details such as putting a slice of red pepper on top of a croissant that has already been disrespected by dressing it in butter and cheese. That is about it. Curious about Matthias Kamann? Check out his website Hej Sweden!